Bulgur is a type of groat made from different wheat species. To make bulgur, wheat is cooked and then dried in the sun. The technique is an ancient way of preserving wheat without grinding it into flour. 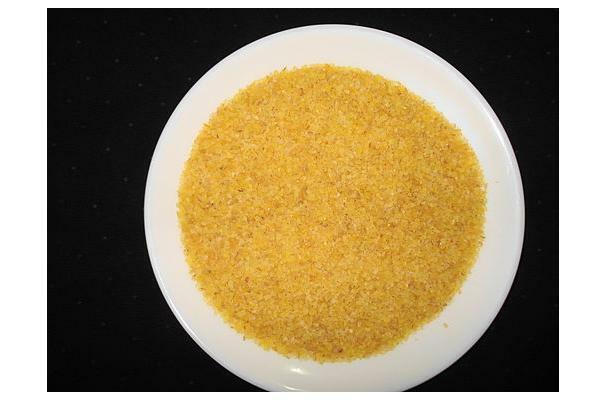 It can be coarsely or finely ground; different dishes require different grinds. Pilaf uses thicker bulgur, while tabbouleh uses the finer grind. Thick bulgur cooks faster than rice but needs a rest period before serving; use a ratio of 1.5 cups water to 1 cup bulgur for 10-15 minutes, then wrap the pot lid in a towel, remove the pot from heat and let rest for 10 minutes. The towel will absorb the steam. Moisten finely-ground bulgur with hot water for a few minutes, and the grains will swell and be ready to use. is made by soaking and cooking the whole wheat kernel, drying it and then removing part of the bran and cracking the remaining kernel into small pieces. Choosing: Bulgur is typically available in four grain sizes: fine, medium, coarse, and whole grains. The different sizes are used for different purposes. Finely ground bulgur is used for hot breakfast cereals and desserts. Medium-ground bulgur is preferred for tabbouleh and other salads, stews, multigrain breads and other baked goods, and vegetarian burgers. Coarsely ground bulgur can be used for pilafs, casseroles, stuffing, and salads. Whole bulgur grains can be added to baked goods or used in soups and stews. Buying: Bulgur is available in some grocery store but is easier to find in health food stores. Combine a half cup of bulgur with one cup of liquid and simmer for 15 minutes. Let stand for another ten minutes. Fluff with a fork. It triples in volume. Avoid lifting the lid or stirring while cooking. Cleaning: Don't wash or rinse bulgur before cooking. Store bulgur in a cool, dry place.